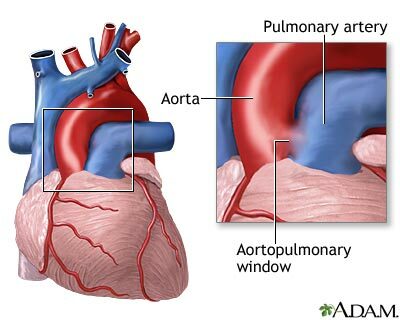 Aortopulmonary window is a rare heart defect in which there is a hole connecting the major artery taking blood from the heart to the body (the aorta) and the one taking blood from the heart to the lungs (pulmonary artery). The condition is congenital, which means it is present at birth. Babies with an aortopulmonary window have a hole in between the aorta and pulmonary artery. Because of this hole, blood from the aorta flows into the pulmonary artery, and as a result too much blood flows to the lungs. This causes high blood pressure in the lungs (a condition called pulmonary hypertension) and congestive heart failure. The bigger the defect, the more blood that is able to enter the pulmonary artery. Aortopulmonary window is very rare. It accounts for less than 1% of all congenital heart defects. Fifty percent of people usually have no other heart defects. The health care provider will usually hear an abnormal heart sound (murmur) when listening to the child's heart with a stethoscope. Cardiac catheterization -- a thin tube inserted into blood vessels and/or arteries around the heart to view the heart and blood vessels and directly measure pressure in the heart and lungs. The condition usually requires open heart surgery to repair the defect. Surgery should be done as soon as possible after the diagnosis is made. In most cases, this is when the child is still a newborn. Call your provider if your child has symptoms of aortopulmonary window. The sooner this condition is diagnosed and treated, the better the child's prognosis. Hirsch-Romano JC, Ohye RG, Si M-S, Bove EL. Truncus arteriosus and aortopulmonary window. In: Sellke FW, del Nido PJ, Swanson SJ, eds. Sabiston and Spencer Surgery of the Chest. 9th ed. Philadelphia, PA: Elsevier; 2016:chap 121. Park MK. Miscellaneous congenital cardiac conditions. In: Park MK, ed. Park's Pediatric Cardiology for Practitioners. 6th ed. Philadelphia, PA: Elsevier Saunders; 2014:chap 15.